Continuing Roseanne without Roseanne Barr is "a long shot" -- "possible but not probable"
Executive producer Tom Werner is expected to meet with showrunner Bruce Helford and Sara Gilbert in a few days after cooling off from the Tuesday's abrupt cancelation "to kick around possible ideas for continuing the show without Barr," according to Deadline. 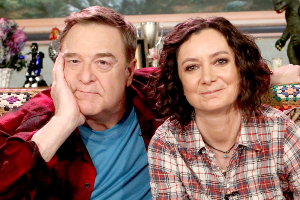 It makes sense for Carsey-Werner Television, which owns and produces Roseanne, to want to keep the series going since the stars are already under contract for next season and they love working together. "Still, there are a lot of hurdles, from coming up with a concept that will live up to the high creative bar set by the original series to changing the name of the show," reports Deadline's Nellie Andreeva, pointing out that ABC is not involved in any discussions to continue the series without Barr. She adds: "An informed source close to the situation said pulling off an offshoot series with the rest of the Roseanne cast is 'possible but not probable.' Another source called it 'a long shot.' If it comes together, Roseanne 2.0 would likely not be ready for fall. if it doesn’t, the focus will shift to who will get paid for the aborted Season 11. I hear there have been no conversations yet with the Roseanne cast, writers or crew about compensation but such talks should be forthcoming if the Hail Mary pass to salvage the show does not work." There is also the issue of Barr and her Twitter account. She's already attacked co-stars Michael Fishman and Gilbert. If Roseanne carries on without Barr, says Andreeva, her "shadow will be looming large in the background." Why Roseanne without Roseanne Barr won't work: "There’s a reason why the Roseanne reboot was so popular, for better or worse: Roseanne Barr," says Joel Keller. "Her unique stamp on her original show built up millions of fans over the nine years it was on the air the first time around, and the 25 years it was on in syndication." Plus, he adds, "without Barr, they’d likely see The Connor Family as just a bunch of 'snowflakes' complaining about not having healthcare. Given Roseanne‘s ratings decline from its premiere as the show went on, losing almost half of the premiere’s audience, ABC likely would have seen a further decline as people checked out the re-reboot and decided to switch to something else." Tom Arnold says Roseanne Barr "wanted" the cancelation to happen: "If it hadn’t happened yesterday, this season would have been so awful for everyone every day because she would have felt like she was (being) taken advantage (of), just like when I left the show." Jimmy Kimmel was criticized for defending Roseanne on Twitter: "What @TheRealRoseanne said is indefensible, but angrily attacking a woman who is obviously not well does no good for anyone," he tweeted. "Please take a breath and remember that mental health issues are real. The Roseanne I know could probably use some compassion and help right now." Lecy Goranson tweets she's "devastated" by cancelation, "but more devastating are the effects of hate speech and racism on individuals and society"
Kareem Abdul-Jabbar says "The Bad-Taste Joke defense just doesn’t work in this case": "You can’t have read a book or newspaper, watched a movie or a television show, or just lived in America for the past 200 years without knowing that any reference to an African-American and an ape is textbook racism. Also, her odd, inaccurate and deliberately inflammatory reference to the Muslim Brotherhood to her average Twitter follower will seem like a slam to all Muslims." Roseanne Barr mocks ABC in her return to standup: "I ain’t dead b*tches"